The beasts lead the historic building to its former site – but an engine does most of the work. 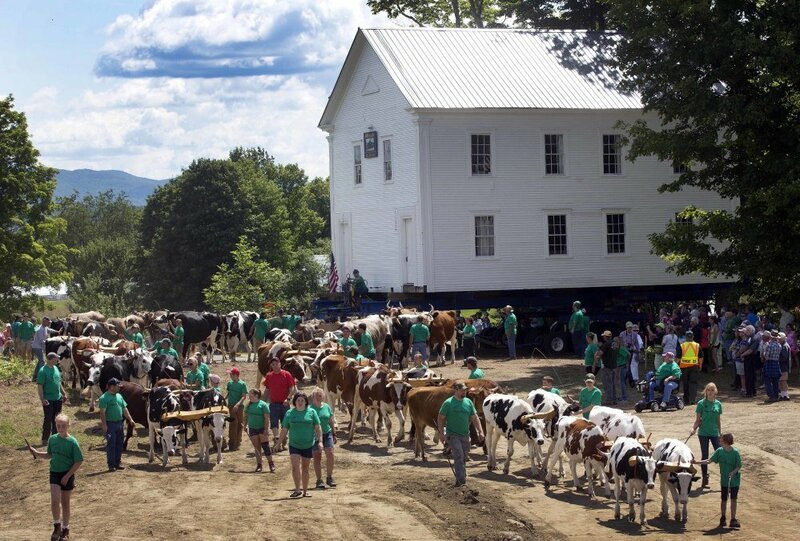 BROWNINGTON, Vt. — With dozens of oxen leading the way, a historic schoolhouse has been relocated to the original spot where a prominent African-American scholar and legislator was once its schoolmaster. For decades, the Orleans County Grammar School served as a Grange hall in Brownington, a hilltop village near the Canadian border. But town officials decided they wanted to move the 30-by-40-foot white clapboard-sided house a third of a mile up the road to restore the village’s historic district to its 19th-century condition. The 105-ton timber-frame school building was moved Monday up a hill by an engine on the back of a barge-like rolling platform that filled both lanes of the narrow country road. The 44 oxen, well, they were there more for show and to give the 900 or so onlookers a feel of what it might have been like to move the house back in the day. The schoolhouse, first relocated in 1869 to be closer to the town center, is now back at the small hilltop campus where Alexander Twilight opened it in 1823 and was its schoolmaster. Twilight is the town’s central historical figure and was the first African-American to graduate from an American college or university, getting a degree from Middlebury College. “We should be selling T-shirts,” said Brownington resident Dawn Perry. The schoolhouse was placed next to a newly built foundation and will be slid onto that later this week. The foundation will be fronted with slabs of granite, to give it a more historically accurate appearance.